The first residents have moved into historic icon Yorkshire Brewery in Collingwood, with the $220 million development almost sold out 18 months after launch. 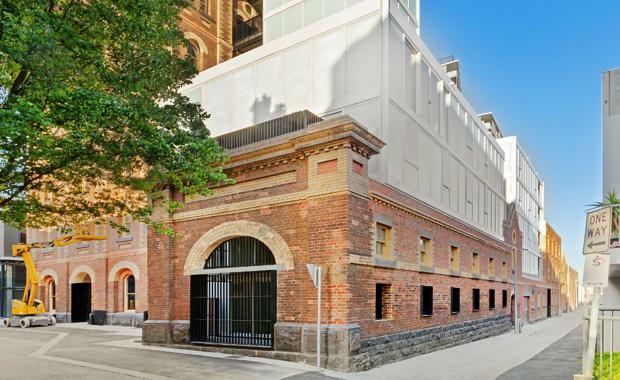 Developer SMA Projects has implemented $7 million worth of heritage works at the former brewery located at 1-21 Robert St in Collingwood, transforming the site into 358 urban-luxury apartments and townhouses. Of particular significance was the restoration of the site’s most prominent feature, the six-story brick brew tower, which dates back to 1876 and was Melbourne’s tallest building for the decade following its construction. Four heritage lofts in the brew tower have already been snapped up, with the penthouse still remaining. Heritage one and two-bedroom apartments in the brewery’s old cellar and stables remain for sale. Two of the first residents, Nina and Andy Hansen, said they were thrilled to finally move into their converted two-bedroom apartment in the brewery’s heritage stable building. “We were attracted to the regeneration of older, industrial areas, and Yorkshire Brewery is a great example of this. We loved the idea that one of Melbourne’s oldest buildings would be given a new lease on life,” said Mrs Hansen. “We were also drawn to the industrial-chic aesthetic with all the intricate brickwork and larger-than-normal apartment sizes on offer. The once industrial Collingwood has experienced significant regeneration in recent years, with the influx of Melbourne foodie hotspots such as Gelato Messina, Huxtable and St Crispin, as well as major retailer Coles settling into Smith St this month. The suburb’s gentrification has triggered an increase in demand for the area with Collingwood now in the top three most searched suburbs for off-the-plan apartments, according to realestate.com.au. It’s population has increased by 17 per cent in five years, making it one of the most sort out areas in Melbourne. “Median apartment prices in Collingwood have skyrocketed by over 30 percent over the past five years,” said SMA Projects Director Martin Strode. “The inner city apartment market may be running hot, but as Melbourne’s population boom spawns a new generation of apartment dwellers, buyers are becoming increasingly savvy. They know what they want – high-quality design, spacious abodes, amenities and something with integrity that they can be proud of,” said Mr Strode. Yorkshire Brewery embraces Collingwood’s eclectic character through the extension of the laneways surrounding the development, as well as a beautifully landscaped piazza that includes local artist installations, a café and deli. The development also provides residents with a rooftop terrace with communal dining room and kitchen, gym and even guest apartments for when visitors come to stay. The final one, two and three bedroom apartments are on sale between $395,000 and $1,150,000. Five heritage apartments are left to sell between $600,000 and $1,600,000. Five townhouses and the penthouse are yet to hit the market.